What is the world’s most comfortable pillow? Is it made of memory foam, latex or natural materials such as cotton or down feathers? Should it have low or high loft and is it suitable for all sleeping positions? If you are asking yourself these questions, you are not alone. We researched different materials and types to present pros and cons of each, so you can decide without even visiting a store. I’m sure that you will find an ideal bed pillow (and more) in this post in less than 10 minutes. 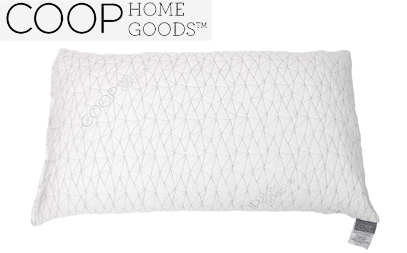 Nest Bedding introduced new and revamped version of their Easy Breather pillow recently. Since the day it was reviewed, it has remained a favorite, even though we've reviewed a lot of products. There are many reasons to love it and, if you choose it, you may find yourself relying on it for a long time to come! Noodle natural latex – Great moldability, classic feel, and fantastic cooling. It comes with an organic cotton cover. Shredded memory foam – Slower response time, nice hug and contouring. Sleeps a bit hotter but provides better pressure relief. With both versions, you can adjust the height to your preference. There is no smell and off-gassing at all, and it’s made in the United States. Do yourself a favor and try Easy Breather, it might just change your life as it did for me. Layla has integrated their copper cooling technology into the cover of this sleek pillow, which is filled inside with shredded memory foam and kapok. The foam inside also contains the conductive copper, so you will likely not find your head overheating – a big plus for anyone who loves the memory feel but finds it can make them too warm. Kapok is unique because it is taken from fibers found in seed pods of the Kapok tree. The trees are mostly found throughout the rainforest, and it is pesticide and chemical-free. If you have allergies or prefer to use products that do not include down, this could be the hypoallergenic product you have been searching for. It comes in two sizes, Standard and King, and the advantage of the shredded material inside is that you can shift it around to accommodate to your sleeping position. If you are looking for an affordable yet fantastic shredded foam pillow this product is spot on for you. Like other products with this type of filling, you can adjust it to your liking and almost flatten it completely if you prefer to sleep on your stomach. The cover is a machine washable bamboo/polyester blend designed to regulate body temperature. It also has a nice and soft feel to it. Tip: If the pillow is going flat, just put it in the dryer for 10 minutes, and it will be nice and fluffy again. It comes with 30 day trial period, a five-year warranty and two sizes (Queen and King). With thousands of reviews on Amazon, there is hardly any room for mistake. I’m sure you will enjoy it as much as I did during the testing period. 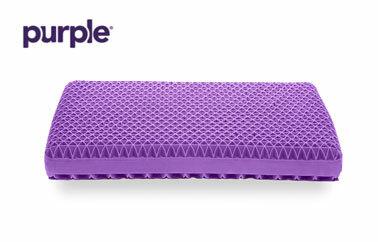 If you are familiar with Purple mattress technology, you will instantly notice the same grid with their pillow. The Hyper-Elastic polymer creates a very cool surface with good support, response and air circulation. It perfectly conforms to head and neck without losing shape. It comes with an inflatable “booster” so you can adjust the height (loft). It can be easily removed if needed. The cover is constructed from polyester, bamboo viscose and spandex. It’s 100% machine washable, so that’s a huge plus. 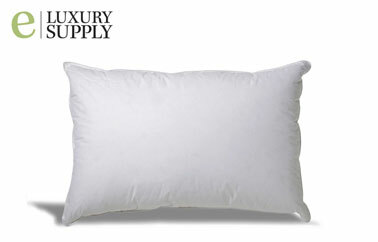 Malouf is a premium manufacturer, and their latex pillow caught our attention around the beginning of the year. 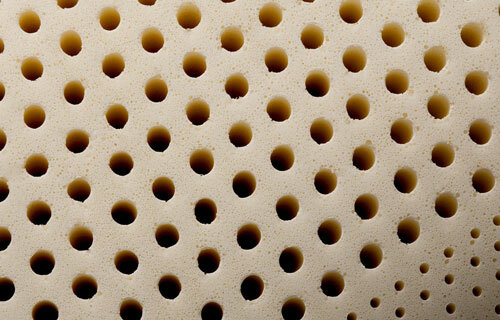 It’s built from 100% Talalay latex without any synthetic additives. It’s constructed with larger and smaller holes to conform to your neck and head perfectly and to provide better than average support. This design also helps with cooling, breathability, and airflow. The cover is machine washable and made from a blend of rayon from bamboo and polyester. It feels very soft to touch. This particular model comes with several firmness levels (plush, medium, firm) and loft heights (low, medium, high). This means it will fit any sleeper style. 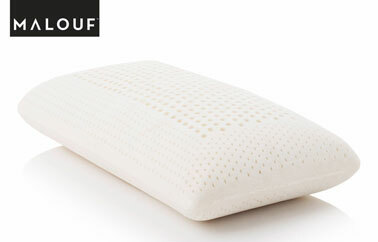 If you want a customizable latex pillow at a fantastic value that cradles your head and provides above average support, you should consider Malouf. This particular option caught our attention due to fantastic reviews on Amazon. And I must say, it’s better than higher priced options on the market. 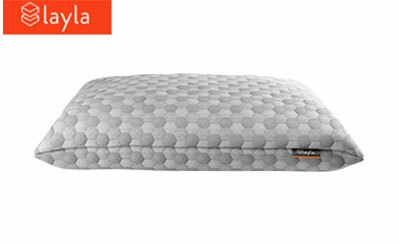 The pillow itself is filled with shredded memory foam so you can easily adjust it and find the perfect height. The cover is made from “Kool-Flow” material as they call it and it’s intended to help with breathability and heat distribution. Another interesting feature is that you can wash entire pillow in machine washer, but it’s difficult to dry, especially during winter. You may also need to fluff it once in a while to get it back into original shape. Overall, if you need a pillow with organic materials and filled with shredded foam, there aren’t many options that can beat Snuggle-Pedic at this price range. 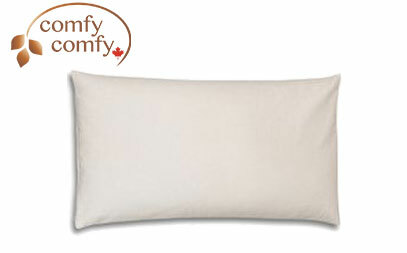 If you want to try something new, I would recommend this 100% USA grown buckwheat pillow from ComfyComfy (or ComfySleep). This type and material allow for much better cooling and airflow since buckwheat husks do not retain heat. But it also makes it a bit harder and not suitable for stomach sleepers, although for back and side sleeping it’s perfect and cradles to head and neck nicely. Of course, you can re-distribute the husks and adjust the loft however you like. This model comes with an organic cotton cover. It provides a soft surface, and it’s machine washable. The only downside I see is that active sleepers, this type creates noise which your partner won’t like. But, for anyone who would like to try something different and completely natural and organic, try Comfy, it’s one of the best out there. 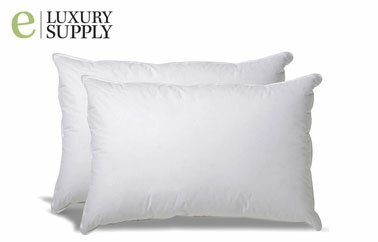 I’ve slept on down pillows for most of my life, and I have to say nothing comes close to this model from eLuxurySupply. When you get your hands on it, you will notice it’s lightweight (2.7 pounds) and very soft. It has medium/high loft but it’s fluffy enough to mold to your head, and it will suit almost anyone. The cover is made from 100% cotton and is machine washable and dryer friendly, so maintenance is that much easier. 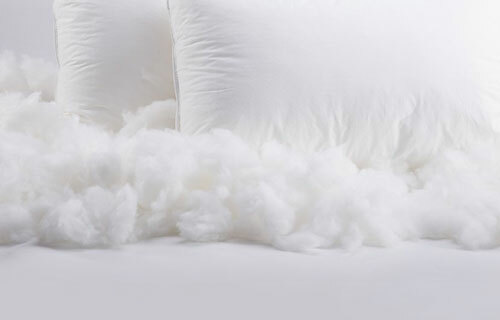 For anyone who wants a traditional down feel and a very soft pillow with lots of hug that’s also durable and has long lifespan, you won’t find any better than this. Naturepedic builds all their products with organic and safe materials, and they do it so well. This particular one is made 100% from cotton grown in the US without any chemicals or flame retardants. It comes in three sizes and a toddler and flat version. It has a very balanced feel to it, not too firm or soft. In conclusion, if you want a homegrown organic pillow that’s easy to clean, has no smell or artificial dyes and chemicals and has a balanced feel to it, you won’t be disappointed with Naturepedic. The Revoloft pillow is filled with lightweight microfiber fill (polyester), and it’s designed to mimic the feel of traditional down feather products. This makes it 100% hypoallergenic, unlike feathers who collect more dust mites and can cause allergies themselves. This type of polyester also means it’s more durable than other “alternative” types. The cover is very basic although it has a nice and soft feel to it. The loft is too high for stomach sleeping, and it’s more suited for back or side folks. In the end, it's a budget-friendly option with a medium-high loft that’s also hypoallergenic. There is no better down alternative pillow than this. Let’s discuss different sizes you will encounter when shopping for a new pillow. It wouldn’t make sense to purchase a King size for a toddler bed, right? Let’s take a look at these standard dimensions, but have in mind that some manufacturers have their own custom sizes. 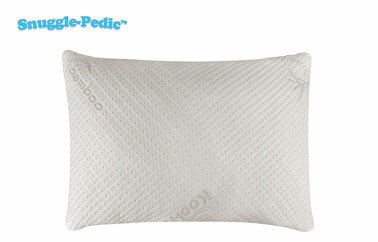 Super Standard 20" x 28"
Material plays an important role when it comes to comfort, feel and cooling properties of your pillow. There is no single “best” type. Different sleeping preferences and needs will require different materials and structure. First, let’s take a look at various foams and then, we will take a look at natural and organic options. Polyurethane, latex and memory foam have become some of the most popular materials in the last 15 years or so. All of them offer fantastic support, contouring as well as cooling these days with higher-end products. They come in three most common shapes that have different properties. Shredded – The most important feature is that these pillows are adjustable and you can change the loft height until you are satisfied. It’s also much more breathable than molded. Recommended for stomach sleepers. Molded – Offers great contouring and support and we recommend it for most people suffering from back and neck pain. Noodle – Similar to shredded foam when it comes to breathability, and you can also adjust it. Good for all sleeping positions. For a reason, this material has become the favorite among people suffering from back or neck pain. It has a slower response time and good “hug” which means it will quickly contour to your neck and head, providing support where it’s most needed. If I had to list one negative aspect, it’s that it retains heat and sleeps hotter than other materials. But, new and improved design with gel on top can solve this problem quickly. You will usually find these products as shredded, molded or noodle foam (or sometimes a mix). Learn more about memory foam pillows in our complete buyer's guide. You will encounter two types, natural and synthetic latex (or a blend of these two). Natural latex is extracted from tree sap and is one of the most eco-friendly materials you can find. A blend is also a great option if you are looking for less expensive products, and it still retains many qualities like hypoallergenic properties. 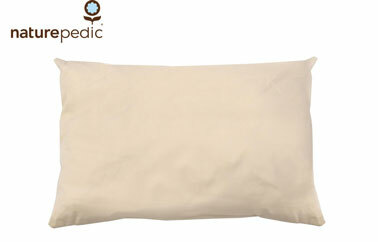 Even though latex pillows cost more, fantastic cooling, durability and natural materials make it worthwhile. If you opt for polyfoam pillows, you will notice a more balanced feel compared to memory or latex foam. It’s also the least expensive of the three. It doesn’t mean it’s the worst. It’s cooler than memory foam but still not as much as latex. One thing to note is that it usually has a strong smell and can be less durable. But, higher tier custom poly-foam based products offer all of the benefits with none of the cons, like our selected product for this category. 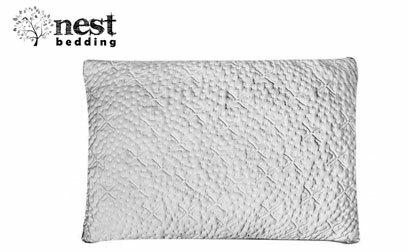 Alternative pillows are created to provide a similar feel and features of natural materials at a much lower price. Obviously, the biggest downside is that these won’t last as long. Because many people suffer from down allergies, manufacturers created an alternative that provides the same feed, but they used cotton or polyester as main fill. If you are looking for better cooling, in some cases alternative pillows can retain less heat than natural down, providing much cooler sleep experience. If you love that soft down feel, but you suffer from allergies, try one of these, and you will love it. Polyester provides a more traditional feel like cotton does. They have good cooling and are pretty inexpensive, but a big downside is that they have the lowest lifespan of all types. You will notice that it flattens easily and can be somewhat noisy. With all this being said, we do not recommend buying polyester products since there are many other natural options you can buy that provide a similar feel for the same amount of money. Wool, cotton, natural latex and down feathers are all extracted from plants or animals, meaning these materials are natural. Organic products must be certified. It means the whole manufacturing process and materials used do not contain pesticides or dangerous chemicals. Must have for people suffering from allergies. Let’s take a look at different types and natural materials used as pillow filling. For our readers who are a bit older, or if you have an elderly family member, you will know all about this type. These pillows are made from down feathers of ducks, geese or swans. It can be a mix of down (soft and fine feathers found under harder outside layer) and denser feathers if you want a firmer feel. It’s typical for down pillows to flatten after some time, that’s why they have greater loft at first. And you have to dry clean them, that’s somewhat a disadvantage. If you tend to sleep hot, down is good until it flattens, then it becomes much hotter. 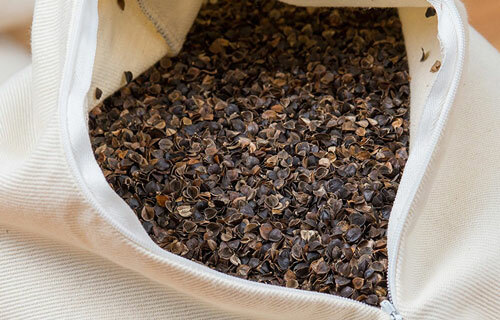 These pillows are packed with dense buckwheat hulls and are a fantastic choice for cooling due to low heat retention. The biggest downside is that the hulls can be quite noisy and unresponsive to movement, so it’s not good if you like to change your position a lot during the night. One of the biggest advantages is that it’s hypoallergenic and it’s suitable for anyone suffering from allergies. Have in mind that you cannot machine wash the hulls. You can either replace them or put them in the sun for a few hours. Cotton is a natural material and can manufacture as organic. It’s also hypoallergenic and has great breathability and cooling. You will find many products with an affordable price tag. With all these above mentions pros, we have to mention that cotton pillows have a shorter lifespan and tend to flatten over time. If you choose a suitable loft, you can use it for any position. We all have different sleeping preferences. Some of us like to sleep on the stomach while some prefer side or back. 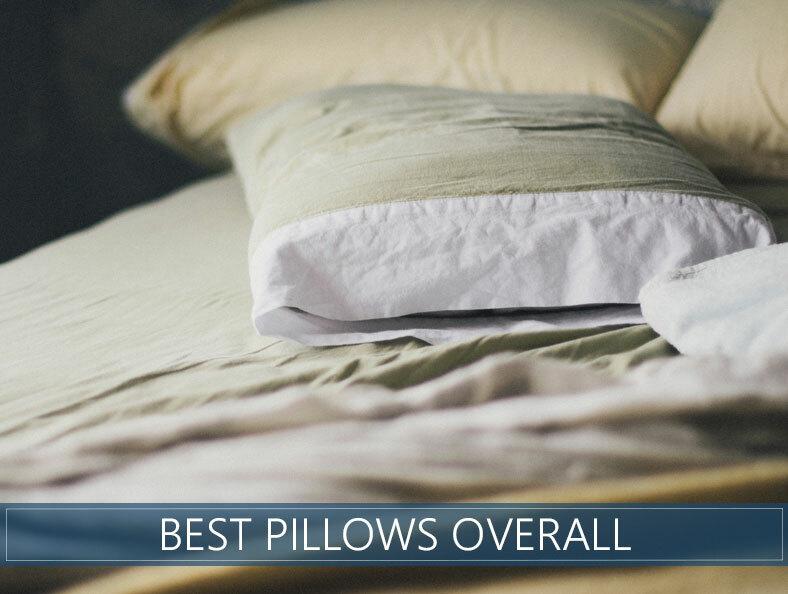 When it comes to your pillow choice, the position will play a major role. For example, loft, density, and type play a significant role in overall comfort and experience. If you are not familiar what loft is, it’s the height of the pillow when it’s on a flat surface without any additional pressure applied. It’s useful to determine which type of sleeper you are and choose according to that. If you are sleeping on your side, you will want to have an adjustable loft just because you can set the height to your preference. This will allow perfect neck and spine alignment. As far as materials, shredded foam (memory or latex) would be a much better choice because of their pressure point relief properties. But, if you want to go natural, you can pick goose down pillow and adjust it to your liking. Keeping your neck and spine in healthy alignment is a priority for any back sleeper. You don’t want your head raised too much (even though some of us prefer that). Low or Medium is better than high loft. Heavier sleepers might want to opt for couple degrees higher to compensate for increased head and shoulder weight. If you are sleeping on your stomach, you will require the least amount of loft. You can even sleep without a pillow if that’s what you prefer. The key here is that your head remains in alignment and that it’s not raised too high. If you combine high loft with a mattress with soft mattress, you will most likely suffer from back or neck pain in the long run. Again, heavier people can opt for medium loft to compensate but you should never go for high. In the last few years, quality cooling pillows have become very popular. I’m emphasizing “quality” because many companies advertise their products as “cool,” but in reality, they are not. Ok, but how to choose the right product, material, and type? Let’s take a look at our graph here and see the cooling properties of different materials. Here are three fantastic choices that utilize different technologies to achieve cool feel. Classic Brands – A layer of gel is applied on top, providing better heat distribution. Carboncool Pillow – Phase Change Covers help regulate the temperature along with aerated foam. Nest Bedding Active X – Filled with Energex foam which does not retain heat. It feels like a mix of latex and memory foam and also has phase change fabric for additional cooling properties. If you suffer from neck, pack or shoulder pain or even more chronic issues like snoring and sleep apnea, your pillow can be one of the causes and it can play an important role in minimizing the symptoms. Let’s take a look at various medical conditions and needs and how to choose a great pillow based on that. Allergic reactions during sleep can often be caused by incorrect pillow type. Materials such as down feathers collect more mites and some people are directly allergic to it. On the other hand, latex, buckwheat, cotton and high-quality memory foam are hypoallergenic and rarely cause allergies. Our Tip: If you love that soft down feel, you can buy an alternative (usually made from cotton) and make sure that you place the pillow outside in the sun to kill off any mites. Snoring, as you know can be a big problem for your partner. But, there is a solution for that, and it’s not some complicated machine or a mouthpiece. In most cases of light snoring, it’s just a matter of finding the right pillow and head elevation. If you sleep on your side, you will rarely snore anyway, so this is a back sleeper problem most of the time. Slightly elevating your head is good, but it can cause neck pain in the long run. This is why we want memory foam more than any other type for this, to help your neck and head with pressure relief while it still helps with snoring. One of the most common causes of neck pain is your mattress and old or improper pillows. Although there could be many underlying conditions, so it’s advised that you consult a doctor before making any decision. Many people make a mistake and do not consider their preferred sleeping position and weight. Stomach sleepers require lower loft (almost flat) so that your neck doesn’t get curved. Back sleepers require medium loft with contouring toward the spine. As for types, Memory foam works wonders when it comes to pressure relief but if you prefer natural materials go for latex or down (if you are not allergic). If you ever suffered from migraines, you know how bad it can get. Not only that it can up to 72 hours, but it can severely impact your ability to perform even the simplest tasks. It’s caused by a spasm of the main artery that supplies the brain with blood. When it contracts, it causes this familiar pain, pulsing, and nausea. One of indirect migraine causes is incorrect sleeping posture. You can easily correct this with a proper pillow to align your spine and neck naturally and to prevent any further nerve irritation. Recommendations: Any memory foam, latex or buckwheat pillow with good cooling properties that keeps your spine and neck naturally aligned. Pillows designed to help with obstructive sleep apnea force you to sleep on your side or stomach while providing enough head and neck support. As some of you may already know, sleeping on your back is not recommended for this condition as it can increase the number and occurrence of apnea episodes. With memory foam construction it allows fantastic contouring while its indentations and shape allow for CPAP machines to remain in place without discomfort. You must be wondering why toddlers can’t sleep on regular pillows? It’s because a child doesn’t have the same neck and head proportions like a fully grown adult. There are several factors to keep in mind before choosing a toddler pillow. Allergies – Many babies suffer from allergic reactions even though we don’t know it yet. If you want to be extra safe, choose a hypoallergenic material and cover. Firmness – You don’t want to buy a very soft product since it increases the risk of suffocation. Go with medium firm options, most kids love it, and it’s safe. Cover – Here, you may go organic if you prefer covers without dyes and harmful chemicals. Cotton or polyester blend is a good choice. Fill Material – Memory foam is one of the most popular choices these days, but if your kid is not allergic, you can opt for a firmer down feather product. Does it have a washable cover? – Most higher-end products on the market will have machine washable covers. You can imagine the stress of trying to clean it during winter days. Size – If you are petite and choose a bigger pillow, you will not have the full comfort and experience. 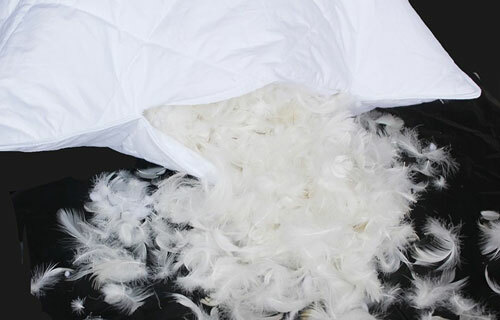 Filling – If you are not allergic to down than feathers are a perfect material for body pillows. Memory foam is an option too if you require a bit more hug and contouring. Wondering what our choice is? It’s Leachco Snoogle. As you can see, there is no such thing as the “best pillow” that will suit everyone in any situation. We all have different needs, and in the end, it’s down to our personal preference. Different fill and cover materials have different cooling, firmness and comfort properties. Hi Jill – I enjoyed reading your pillow ratings. I’m going to purchase the Editor’s Choice, which comes in two fillings. It’s important to me that there is no smell and no off-gassing. Have you tested both fills for those qualities? If not, which fill are you referring to in your assessment? Thanks so much! Hey Elizabeth, let me pitch in while Jill is away on vacation. I have the Easy breather and I haven’t noticed any smell even during the first few days. You will never encounter this issue with latex, only memory foam in general. Hello, how would you recommend $200 bedgear lighting 2.0 pillow? I’m wondering why you would not include the mypillow pillow? I would urge you to reconsider having any pillows/comforters etc on any list containing down feathers. This is a very cruel and inhumane industry that terrorizes and tortures live animals for their feathers leaving them with broken bones and torn skin tissue etc.